Double Duet 4 Device charge at once via one single cable. You can charge simultaneously 2 Apple 8 pin Lightning device like Smartphone , Tablet and 2 Samsung devices or any micro USB capable device. All can charge thru a single USB outlet. This cable can charge your device in full speed and is compatible with all the newest gadgets available. Perfect for traveling and to reduce clutter of cables for different devices. If you have a power bank it can charge using this cable as well. 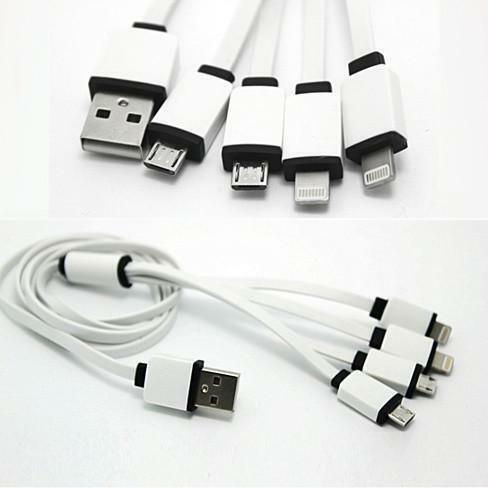 Cable has 2 - 8 pin plugs for Apple devices and 2 micro USB plugs for Samsung devices or any other micro USB devices. Fully Compatible with iPhone 5/5s 6/6plus, iPad 4/5/Air, iPad mini, Samsung Galaxy, Note, Tab, LG, HTC and others with microUSB ports. Cable is 3 ft. in length.